If you were lucky enough to be in Toronto yesterday morning, then you cannot have missed the electrifying excitement that is the Scotiabank Toronto Waterfront Marathon. The flagship event of the Canada Running Series, the marathon has distinguished itself as Canada’s biggest and most prestigious race weekend. And while the home-grown competition at Scotiabank Toronto is always of a high caliber, this year saw Canadians Eric Gillis and Lanni Marchant running for the 2016 Olympic standards on the notoriously flat and fast course. Two-time Olympian Eric Gillis famously ran his 2012 London Olympic qualifier at Scotiabank four years earlier, squeaking under the 2:11:29 standard by a margin of just one second. He finished yesterday’s marathon in a less nail-biting fashion, with a time that was more than a minute under the more relaxed 2:12:50 standard, qualifying for his third Olympic games in Rio 2016. Gillis now joins Speed River training partner Reid Coolsaet on the list of Canadian men with a Rio-qualifying time on the books. 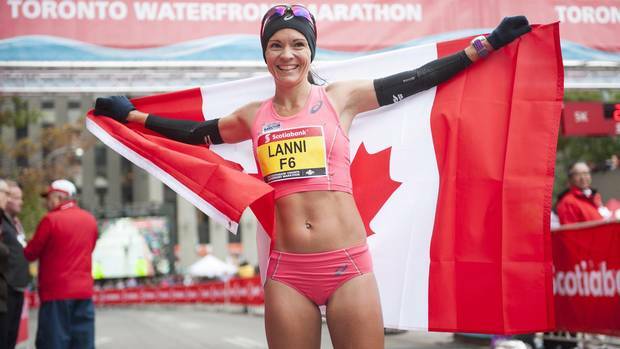 But while Rio represents yet another Olympic games for both Coolsaet and Gillis, the real story in yesterday’s marathon was a Rio-qualifier for Lanni Marchant. Marchant, who shattered Sylvia Ruegger’s 28-year-old Canadian marathon record on the Scotiabank course two years earlier, ran a 2:28:09, just a few seconds shy of her own Canadian record, but comfortably under the 2:29:50 qualifying standard for the 2016 Games. That Marchant was able to bring home a 2:28:09 marathon yesterday morning isn’t especially jaw-dropping, given her past strong performances. What is noteworthy is that both Marchant and fellow Canadian marathoner Krista Duchene are now set to become the first women to represent Canada in an Olympic marathon in two decades. Both women had achieved the IAAF qualifying standard for the 2012 London Olympic Games, but fell short of the more rigorous “A” standard required by Athletics Canada. Marchant and Duchene petitioned to be named to the Olympic team under the Athletics Canada “rising star” provision, but both their petition and subsequent appeal were denied. As a result, Canada went unrepresented in the 2012 women’s Olympic Marathon; just over a year later, Marchant shattered the long-standing Canadian record with a blistering 2:28:00 finish at Scotiabank Toronto, with Duchene hot on her heels in 2:28:32. That Marchant and Duchene are now poised to represent Canada at the Olympic level is no small thing. Though the Canadian men’s marathon elite have enjoyed representation on the world stage in decades past, the women’s marathon has been consistently brushed aside. But in the three-plus years since she was left off the London 2012 team, Marchant has proven time and again that she is a world-class athlete who belongs on the world stage. After running to a strong 4th-place finish in the 2014 Commonwealth Games marathon, the Canadian went on to win bronze on home soil in the Pan Am Games 10,000m. Fielding a strong pair of female marathoners in the first Olympic Games since Atlanta 1996 marks a turning point for women’s distance running in this country. And with even more rising stars, including Natasha Wodak, Rachel Hannah, and Natasha LaBeaud clocking world-class marathon times, it’s beginning to look as though Marchant and Duchene have lead the charge in the resurgence of the Canadian women’s marathon. If yesterday’s result is any indication, the revolution has only just begun.